I’m Mitch Berg. I’m one of Saint Paul’s tiny film of conservatives, so you’ve never had the faintest hint of a reason to pay attention to me, and you likely never will. And it – like everything about Saint Paul’s governance – shows. But I come today not to bury you, but to show you some common ground. Councilman Carter, you may be a politician, but otherwise you are by all accounts a law-abiding citizen. There’s no indication you don’t follow the rules . 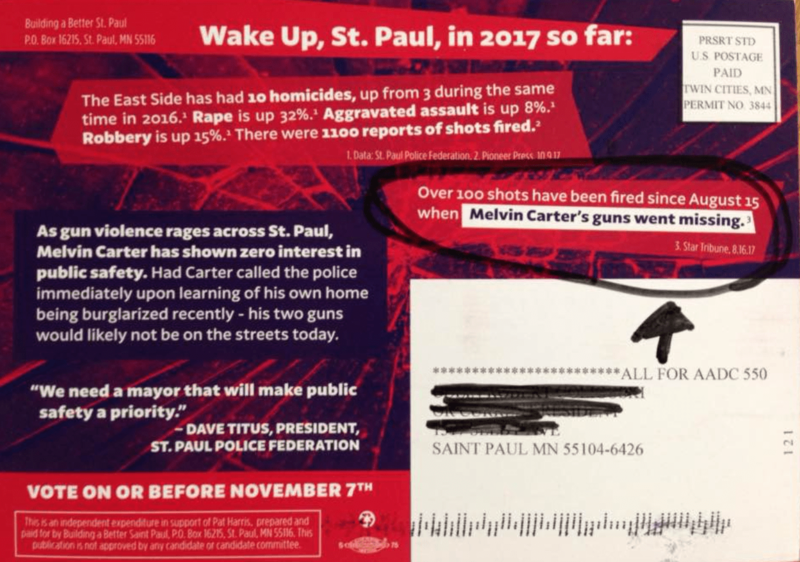 And yet here you are, getting smeared by the police union (an integral part of the Metro DFL establishment) that you are also a loyal, elected part of) for things that are not you fault, that you’re not responsible for, and that you have nothing to do with , *even as* the person who allegedly burgled your house – the bad guy, here – slides anonymously and without ceremony toward his eventual, inevitable catch-and-release date. In other words, Melvin Carter, yoiu on the business end of the same collective smear Big Left dishes out to *all* law-abiding gun owners; blaming the law-abiding for the actions of the criminal; burdening the law-abiding but ignoring the criminal. (“But wait! It’s not bigotry against gun owners! It’s racism!”, someone will say. Why choose? It’s both; the roots of gun control are intensely racist). Including the laws and rules about securing the guns; the law is about safeguarding kids, not burglarproofing your collection; a trigger lock or locked gun box is ample to meet the law’s requirements. If the law required us to make every potential danger in our houses theft-proof, we’d all live in fortresses, and we’d all *still* be criminals one way or another. Other than, of course, the culplability he shares with this city’s current government, ruling party and political class of which he’s a part, of course. Speaking conceptually, here. I don’t own guns. They terrify me.